About 5 miles from the Chernobyl Nuclear Power Plant Complex and a mere 3 miles from the border of Belarus lies the abandoned village of Krasne (Красне). It is located on the left bank of the Pripyat River and was previously part of the Red Chernobyl area. The village was liquidated in 1986, the year of the nuclear explosion, and its residents where relocated to the Ivankov district, the equivalent to moving to a different county in the United States. The winding, single lane drive to Krasne took about 45 minutes from the village of Chernobyl, so there was enough time to ponder the lives impacted in the villages that passed by my car window: Koshivka, Starosillia, and Zymovyshe - just a few of the over 188 villages evacuated after the catastrophe. Near the center of the village is the Russian Orthodox Church St. Michael’s built in 1800. 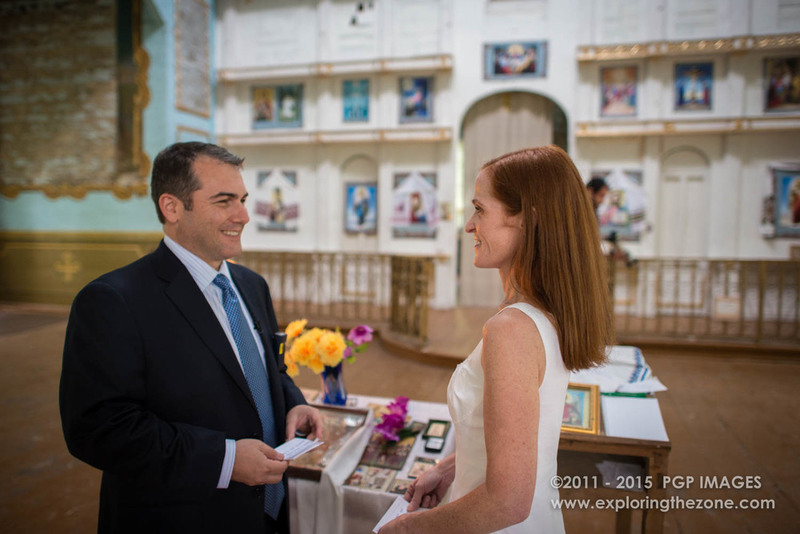 My fiancé, Elizabeth, joined me on this expedition, which was her 2nd time in the Zone. 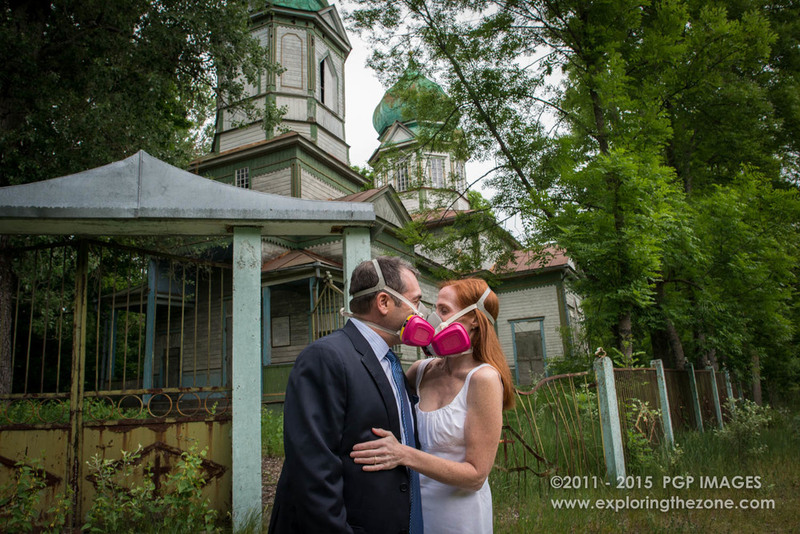 She originally encouraged me to photograph in Chernobyl and, as you can imagine, it has been a big part of our lives ever since. 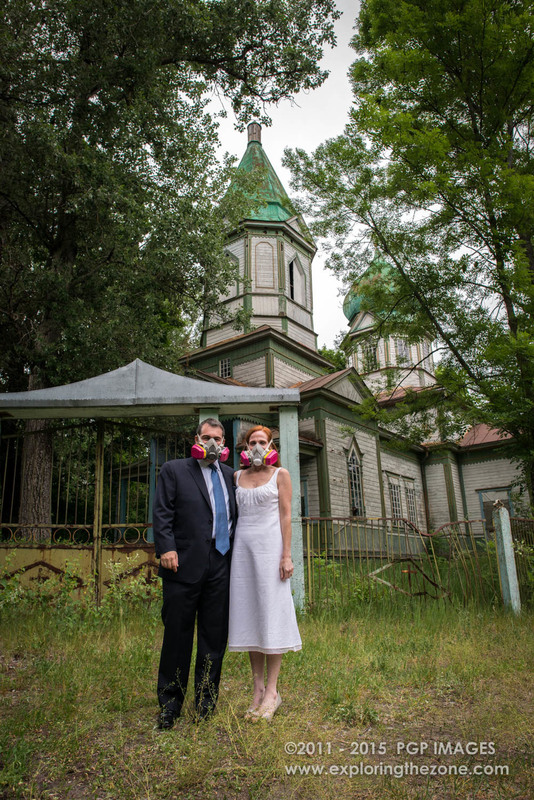 Considering that we wanted to have a small wedding that would have special meaning to us, we decided that Chernobyl should clearly be the place and the Church in Krasne should be the location. 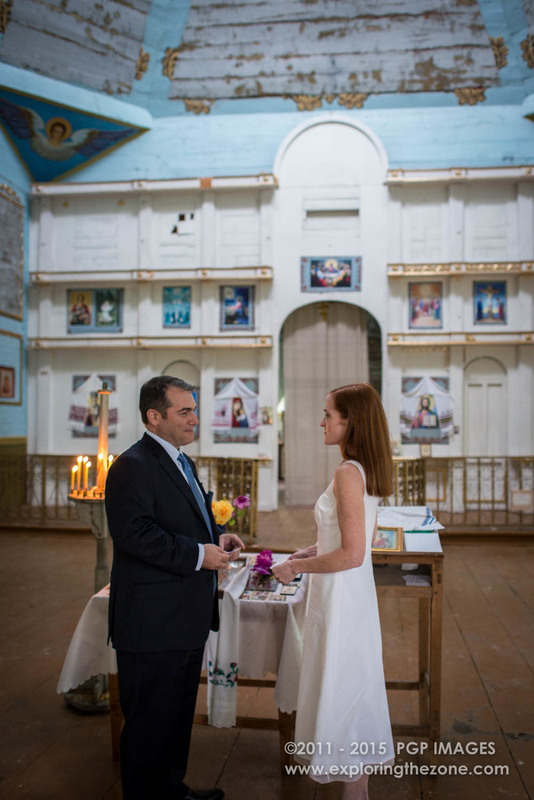 Although, neither Elizabeth nor I are Russian Orthodox, we were given special permission by the religious authorities in the Zone to be married in this historic location. Encompassed by iron gates decoated with a cross and diamond motif stands this 215-year-old church, shockingly not as dilapidated as one might imagine. The peeling, thick, white painted exterior, the 8 feet tall, mustard-toned oak doors, the blue and green painted, hand-carved details and embellishments, and topped off with not one, but two patinated copper, classic, onion turrets (common for Russian Orthodox churches) all rise in the most beautiful, regal, colorful contrast amidst what is now a forest. Officially, St. Michael’s has not been used in decades, but is still in good condition. After viewing so many buildings that have become ruins, one can only look at this fascinating structure and imagine its future. 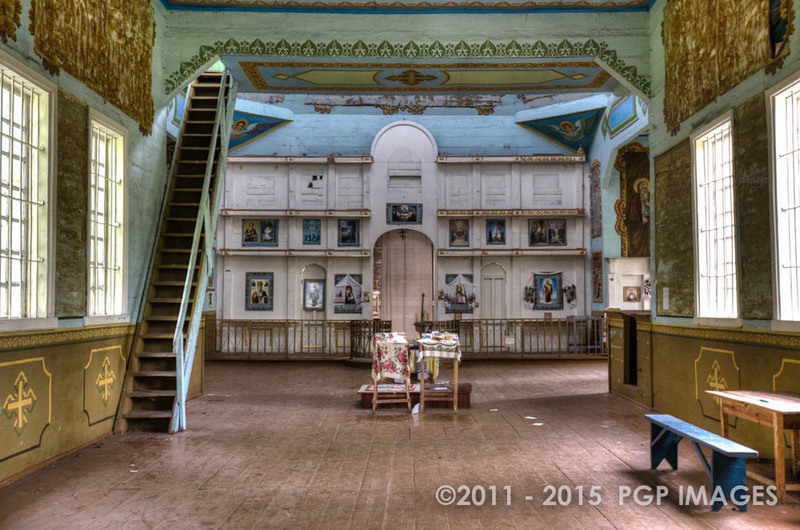 The pews have all been removed and several of the decorative wall coverings have shed and paintings have disappeared. In the nave, a manoumalia (candle stand) and iconostasis (icon stand) are still poised and the center of attention. Accompanying these staples of a traditional Russian Orthodox church, there is a small table where people still come to leave offerings. There is a book on the table where the few, determined people who have managed to visit the church have written their prayers in order for the priest, who still oversees the church, to also pray. Elizabeth and I wrote ours and signed the book. 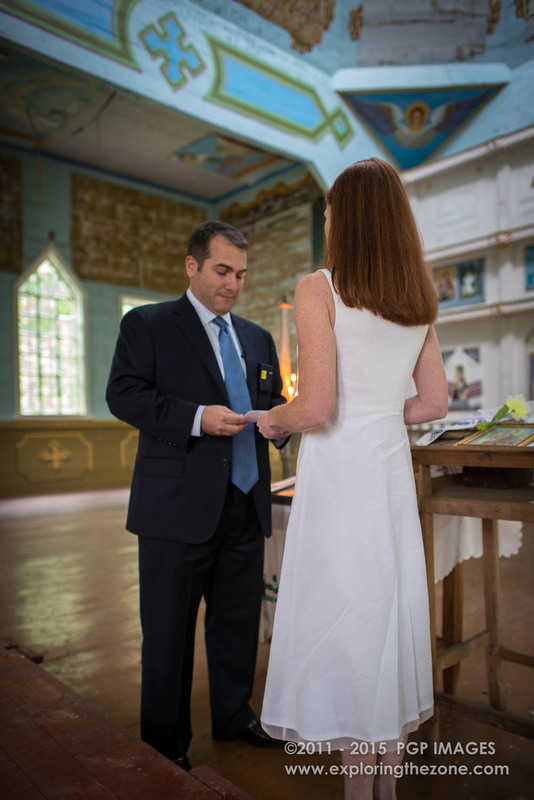 We don’t think the priest speaks English, but we feel blessed nonetheless!